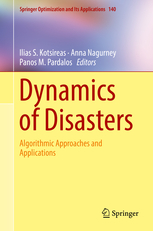 We extend an invitation for those studying topics related to disasters to submit an abstract and paper by clicking on this link: https://easychair.org/conferences/?conf=dod2019. Instructions are available here. Alternatively you may contact the conference organizers. Abstracts and papers are to be typeset in Word or LaTeX and submitted as PDF files. A Springer proceedings volume is planned, containing papers presented at the conference. A link to the Elite City Resort on-line secure registration system will become available. Please book your room at the Elite City Resort as early as possible, in order to receive the conference rate. Early July is a very busy tourist season in Kalamata and the surrounding region.